While meeting Islamic Jihad leader, Iranian parliament speaker calls for unity in fighting 'occupation,' praises Gaza terrorists. Islamic Jihad leader Ramadan Abdullah Shalah is currently in Iran to meet senior officials of the Islamic regime. On Wednesday, the terror group leader met Ali Larijiani, chairman of the Iranian parliament. Larijani praised the "victories" of the Arabs in Gaza during the two most recent clashes with the IDF, Operation Cast Lead and Operation Pillar of Defense. According to the Iranian, the two operations "marked a new chapter in the history of the struggle of Palestine." The Iranian official stressed that armed warfare against the "Zionist regime" is the only way to "free Palestine," and that Iran's policy has always been the "defense of the Muslim peoples, and particularly the rights of the Palestinian people under occupation." He did not note that Iran has also been sending soldiers to take part in the Syrian bloodbath that has Muslims killing Muslims. 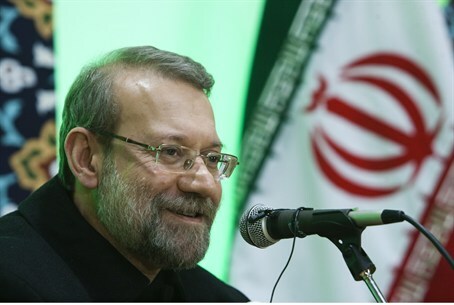 Larijani further claimed that the "occupation" is trying to weaken the Islamic opposition and make it forget the reasons to "free Palestine," and called for unity and solidarity against the "pompous forces" of the West and Israel who are trying to capitalize on "differences of opinion" in the Muslim world. Also speaking of unity, Hossein Salami, commander of the Iranian Revolutionary Guards, said this Saturday that "if the Islamic nation would unite, it could minimize the breathing room of the US and the West until the Zionist regime would no longer have room to breathe." Abdullah Shalah responded to Larijani by expressing his appreciation for Iran's support of the terror groups combating Israel, calling Iran the "largest supporter of the Palestinian people." Recent reports have indicated Turkey surpassed Iran as the leading sponsor of the terror organization Hamas. "The arrogant forces and Israel have started a process meant to strengthen the occupation regime," claimed Abdullah, apparently referring to the peace talks which have already proposed an Arab capital in Jerusalem and Israeli withdrawals from over 90% of Judea and Samaria. Abdullah Shalah visited Iran similarly in 2012 to meet with then President Mahmoud Ahmadinejad, who told him what an "inspiring role that the Palestinian people's resistance has played in driving Muslim nations to stand against their tyrannical rulers." In January, Iranian lawmaker, cleric, and Majilis (council) member Mohammed Nabavian threatened that "having a nuclear bomb is necessary to put down Israel." Despite the lifting of US sanctions in January, Ali Akbar Salehi, the head of Iran’s Atomic Energy Organization, said Wednesday that the interim nuclear deal is not limiting Iran's nuclear research and development at all.